Alexis Slater graduated from Wake Forest and went straight into a job at Polskin Arts in LA, doing PR for museums and cultural institutions. While in this role Alexis realized she wanted to be the one telling the stories instead of pitching them. She is now obtaining her MA in Art History at UT Austin, preparing to enter the curatorial field. 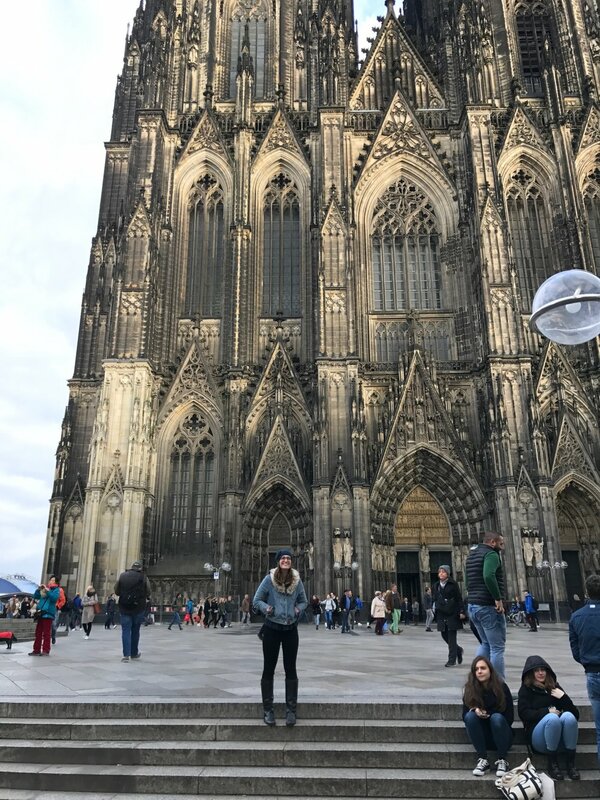 We interviewed Alexis in Fall 2017 before her class trip to Germany to learn more about her story. DeacLink: Tell us about what you’re doing at the moment. Alexis Slater: I am currently getting my MA at UT Austin, with a focus on the Northern Renaissance working with Dr. Jeffrey Chipps Smith (whose work I had read in Dr. Bernadine Barnes’ Northern Renaissance course at WFU). I wanted to work with Dr. Smith because the questions he asked in his work are some of the questions I’m personally curious about. This idea of seeking out scholars that ask the “right” research questions was something that I learned from a conversation with Dr. Barnes my senior year at Wake and really impacted my search for the right grad program. In one of my favorite classes this semester, I’m studying Cologne and Nuremberg in the late medieval to early Renaissance period with Dr. Smith and Dr. Joan Holladay. We are going to visit both these cities next week. It’s really important to see these things we’re studying in person, in their original contexts—you certainly can learn more in person than from a slide. I am also taking a class about Roman architecture during the Republic; we cover construction, deconstruction, and reconstruction which ties in with my interest in cultural heritage. DL: Sounds like a great program. Could you elaborate further on the experience? AS: As a whole grad school is challenging in a way I wasn’t necessarily expecting, but I’m very appreciative of the experience. I can already see myself improving as a thinker and a scholar. It requires a different level of thinking and a lot of figuring how things work on your feet. For example, being assigned readings in languages I don’t speak (which is pretty intimidating) forces me to figure that out. Assignments like this are great for expanding the mind and making me more flexible as a historian and person. I’m also surprised at the amount of group projects there are in grad school. It’s been useful from a teamwork standpoint, and sometimes group members are fluent in the languages our assigned texts are written in. There is so much more to be learned from original texts than an English translation; the original Italian or French can get more points across about the work we’re studying. DL: Take us through your journey to grad school since Wake. We understand you had worked a job before enrolling? AS: Yes- I graduated from Wake Forest having completed a double major in Art History and History. My thesis in History was on Alexander the Great’s conquest in Persia, with an emphasis on cultural heritage. Specifically, I looked at his destruction of the palace at Persepolis. My art historical thesis focused on the influence of the female patron, Elisabeth Borluut, in the commissioning and creation of the Ghent Altarpiece. I was actually able to conduct research in Belgium for this through Wake’s Lynn Johnson Travel Award. In the spring before my senior year, I travelled to Ghent and Bruges where I was able to see the Ghent Altarpiece in the flesh. Seeing the original chapel setting of the Ghent Altarpiece was instrumental in helping figure out a new way to view this important (and frequently written about) work. I noticed that the keystone of the “Vijd chapel”, which was a coat of arms, was actually split between Vijd and Borluut heralrdy! This in-person discovery—something I hadn’t seen mentioned in my reading—totally changed how I thought about the entire altarpiece. I took a year after graduation to live in Los Angeles, where I was working for Polskin Arts and Communications Counselors. Polskin is a firm working specifically with museums and cultural institutions, with an impressively wide range of clients like MoMA, the Whitney, SFMoMA and The Broad. My role here was mostly focused on an account for The Getty Initiative, which comprises more than eighty exhibitions and institutions outside of California all tied into the arching theme of Latino and South American art. I also worked on the reopening of Hollywood’s Ford Theatres, and worked on projects and events for the Natural History Museum and the Sotheby’s LA office. PR for museums and institutions was fun, and definitely a challenge outside my area of familiarity. I came in with basic knowledge from a previous marketing and communications internship, but the role at Polskin required me to foster relationships with local and national press, whether it’s getting them to cover an exhibition or attend a ribbon-cutting ceremony. I had to find common links between the scope of an exhibition and the interests of a publication. Through this you get to know exhibitions really well; I was able to attend previews and explore archives as part of my job which was really great. I realized during this year, that I wanted to be the one telling stories instead of pitching them. I craved a more active role in art history- asking questions, doing the research, writing theses, and crafting the stories I wanted to tell. The questions you’re allowed to ask in art history can go deeper, and be, of course, more academic, than journalism allows. With this realization I decided to pursue grad school. DL: The work experience you’ve had seems very beneficial. How did you find and apply to the Polskin position, and previous internships? AS: Interestingly, the Polskin representatives had come to a USC (University of Southern California) class in February to field interest among students, because the women who run the LA office got their masters there. They were after a USC candidate, but my friend in the class that day texted me saying the role would suit me perfectly. I applied off her recommendation but was initially told that because of timing, it wouldn’t work out. Once I graduated from Wake and moved back to LA in May, I sent an email to Polskin asking if they were still looking for somebody; which they were. I interviewed shortly after and started days later. The circumstances certainly fell into place on this occasion. Most of my other internships I simply applied for online; the Reynolda House internship was a fantastic opportunity, and Wake students should definitely look into their many internships within the program. They offer focuses like educational development or marketing and communications (I did education my sophomore year and marketing as a senior). Both of these experiences primed me incredibly well to go forward, and they’re such passionate people at Reynolda with a real interest in helping students. I also did an internship at the National Portrait Gallery in DC, which I applied for through their online application portal. For the NPG I interviewed on the phone with the curatorial team of the Painting and Sculpture department, which included Chief Curator Brandon Brame Fortune and Curator Dorothy Moss. Another slightly random but interesting internship was on I did in Berlin while studying abroad. I had attended an artist talk at the gallery, Kinderhook & Caracas during Berlin Art Week, and found the space really interesting. I sent them a cold email afterward stating my interest in the space and the projects going on there. They had me helping with an exhibition in my time there- a performance work by Norwegian artist Hanne Lippard. DL: That’s great- reaching out and being assertive can really go a long way! What works best during interviews, from your range of experiences? AS: It’s okay to take time with your answers. If you rush into your response, you might not say what you really wanted to. If a question catches you off-guard, take a moment to breathe and search your brain for the words you want to use. Avoid using ‘um’ and ‘uh’ as well! DL: How do you like living and studying in Austin? What is the art scene like there? AS: Austin is a very cool city, with lots of energy pulsing through the air. We have Austin Art Fair in October which always brings a buzz; the gallery scene is expanding quickly as well. There’s also a prevalence of live music- even at my local grocery store on the weekends. Austin is called the live music capital of the world, and they’re very dedicated to this distinction. Austin is sprawling like LA, so you need a car here. The traffic can be pretty bad, which reminds me of home but is obviously more frustrating than comforting. It’s definitely a cool place to move.. I wish there were more Wake alums here! It’s a very lively place and everyone is excited to be here. DL: What’s the best kernel of advice you can think to pass on, or currently go by? AS: Be open! Don’t limit yourself or think you’re set in something. When changes come your way, accept and roll with them. If you keep your heart and mind open to new experiences, you’ll gravitate toward the things that interest you along the way naturally. Don’t ever allow yourself to feel stuck or stationary- change is always a good thing.